How modern wireless communications and compute technologies – in particular private LTE – hold the key to unlocking the next step in the digitalization of power plants. Utilities today are operating in a constantly shifting environment, an environment driven by a nexus of changes in technology, regulation, and consumer behavior. So what do these changes mean for the future of energy generation? Firstly, consumers are becoming prosumers, producing and selling their own energy thanks to more affordable renewables generation and energy storage. At the same time, consumers are demanding more renewable energy. For utilities, “green” is no-longer optional, it’s a must-have. What’s more, humanity’s dependence on energy means security ­– both digital and physical – needs to be tighter than ever before. These mega trends are causing utilities to become more efficient in both operations and maintenance, detecting physical security threats faster, improving the response to natural disasters, boosting environmental credentials, and bolstering staff safety. Yet the only way to achieve all of these goals is to become an “empowered power plant” that embraces next-gen wireless comms. But what exactly is an empowered power plant? Like many other industries, power utilities are driving for greater digitalization. But to get there, utilities need to connect more things, people, and locations using wireless connectivity. Traditional consumer cellular networks don’t offer the coverage or consistency required for mission-critical, super-low latency communications. Instead, the next-generation of power plant communications requires wireless pLTE (Private Long Term Evolution) networks that are ubiquitous, pervasive and secure, delivering predictable QoS (Quality of Service) and the freedom and flexibility only wireless technology can offer. So we know the advantages of pLTE, but what are the legacy technologies it’s replacing? Conventional power plants, such as nuclear, thermal, and renewables, all rely on digital communication technology. Even the most traditional hydro powerplants, having been in operation for many decades, have seen some form of digitalization with the introduction of PLCs (programable logic controllers). In addition, many plants are supported by PMR (private mobile radio) for communication among the operations staff. This voice communication is considered mission critical, as it might be the only available communication in case of a black-out. Alongside PMR, power plants use Ethernet onsite, and connect to the utility’s backbone network via fiber or microwave technologies. They also use local cabled networking for CCTV video surveillance, plus Wi-Fi for non-critical IT applications. But these are no longer enough. They’re costly, and hamstrung by technical limitations. Wired connectivity is good but it quickly becomes limiting in retrofit scenarios and when utilities need to inter-connect all their systems, sensors, pumps, and machines. It’s a barrier to fully digitalizing their processes. Furthermore, voice and data technologies for on-site mobile communications are showing their age. They lack broadband data capabilities, so can’t be used for video conferencing and Push-To-Video or to connect thousands of sensors and machines. But why use pLTE mobile technology? Ethernet is reliable, but costly and inflexible. Wi-Fi is cheap but inconsistent, not what you want for mission-critical comms. However, pLTE can support both human and machine communications on a single, reliable network. You get wide area coverage, huge bandwidth, natural mobility, and a single network that can support voice, mobile broadband, and IoT Internet of Things devices. If a capable pLTE comms network is your power plant’s nervous system, a powerful cloud service is its brain. 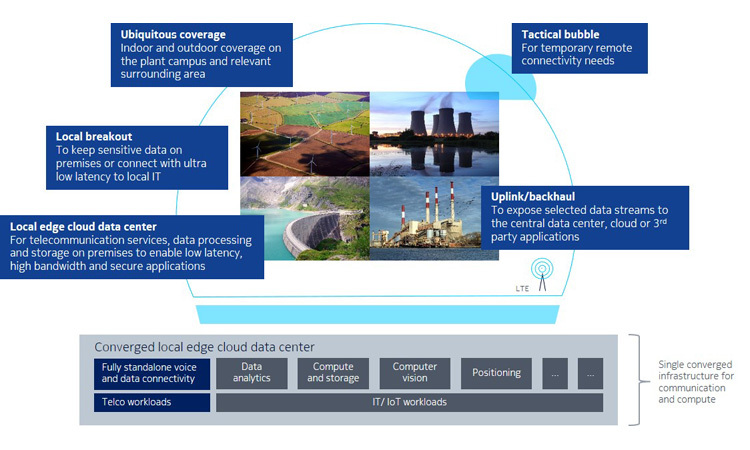 This local edge cloud lets you run essential telecommunications functions in a virtualized environment directly on-site, with the additional processing capacity to run and deliver super-reliable, low-latency IoT applications locally via your pLTE network. Island mode A full standalone communications network capable of operating in ‘island mode’, independent of external communication service providers, the internet, or power outages. Dedicated coverage A high-speed 4G (and soon to be 5G) network with the ability to customize performance to each specific application. Security You’ll have a reliable, secure mobile broadband communication layer for mission-critical and business-critical people, machines and applications. Future proof mobility Make use of advanced applications by people and on mobile assets such as containers, vehicles, and drones. Outside of your pLTE network, devices can seamlessly hand-over to public LTE networks. Manfred leads at Nokia the IoT Business Development for the energy & utilities sector in Europe and is an entrepreneur at heart. With a decade of experience at the intersection of utilities and telecommunications his passion is to make sure that technology serves utilities and to enable the energy transition – making clean and affordable energy available to everyone.